Pulse carrots and onion in food processor until finely chopped, 10 to 15 pulses; transfer to bowl. Process pancetta, porcini, and anchovy until finely chopped, 30 to 55 seconds; transfer to separate bowl. Pulse tomatoes until mostly smooth, about 8 pulses; transfer to separate bowl. Melt butter in oven over medium heat ad processed pancetta mixture and cook until browned, about 2 minutes. Stir in processed carrot mixture and cook until softened, 5 to 7 minutes. Stir in sugar and garlic and cook until fragrant, about 30 seconds. Stir in meatloaf mix, breaking up meat with wooden spoon, and cook for 1 minutes. Stir in milk, scraping up any browned bits, and simmer until nearly evaporated, 18 to 20 minutes. Stir in processed tomatoes, water, and linguine an bring to rapid simmer. 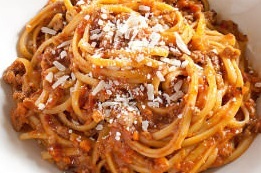 Cover and simmer vigorously, stirring often, until pasta is tender and sauce is thickened, 12 to 16 minutes. Off heat, season with salt and pepper to taste and sere with parmesan. End.